Keep track of your account(s) anytime, anywhere. Login and instantly view your account summary, details and transactions at a glance. Visit www.citibank.com.cn for our latest promotions and information on our products and services. Keep track of your account(s) anytime, anywhere. Log in and instantly view your account summary, details and transactions at a glance. You can click account to review your Account Summary, Account Details & Transaction Activity, Monthly Account Statement (if you are enrolled in Electronic Statements) , set account nickname or download your account activity. Select the function you require. Your account(s) have been categorized into Settlement Account, Saving and Investments and Loans, helping you to manage your wealth efficiently. 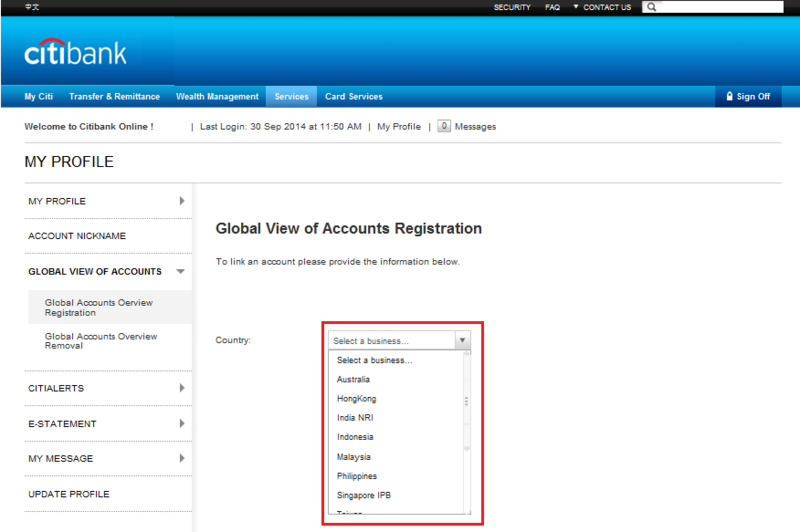 If you have Citibank account from these countries/region (Singapore, Singapore IPB, Australia, Indonesia, Malaysia, Taiwan, UAE, Thailand, Philippine, India NRI,IPB UK or USA), you can link all these account together through Citibank Online, through one time online verification, you will be able to access your multi-nation account information anytime. How do I log into Citibank Online? If you are new to Citibank Online, you will first need to create your online user ID, password and security questions. You can do so in 5 easy steps! Step One：Choose your registration account type. Step Two: Read Citibank Online Services Terms & Conditions. Step Three: Fill in your registration information. Step Four: Input your OTP. Step Five: Set up your online user ID and password. If you already have your online user ID, password, you can begin using Citibank Online in 3 easy steps! 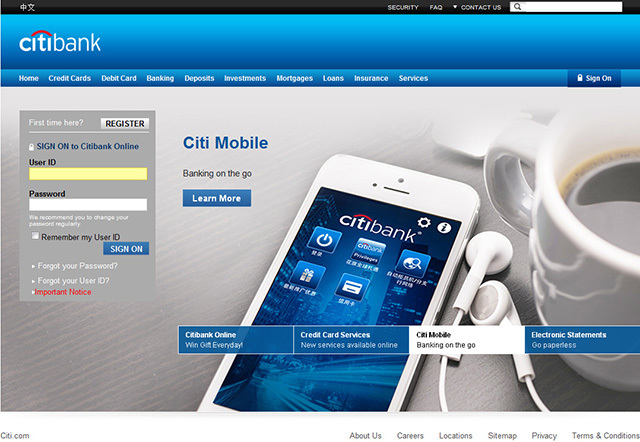 Step Three: Begin using Citibank Online! Who can use Citibank Online (www.citibank.com.cn)? Citibank Online is available to all customers of Citibank (China) Co., Ltd. You only need a Citibank Debit Card or Credit Card and ATM PIN (APIN) to access our Internet Banking services. What are the services available on Citibank Online? What do I need when I login for the first time? You will need the following – Your 16 digit Debit Card or Credit Card Number (CIN) and ATM PIN (APIN). You can also use credit card number,CVV2 and ID number for registration. How do I apply for my Debit Card? You need to visit us at any of our branches to apply for a debit card. If you are new to Citibank Online, you will first need to create your Online User ID and Password. What if I forget my Online User ID? To retrieve your Online User ID, click on "Forgot your User ID?" link on the login page. You need to provide: (1) Your Debit Card or Credit Card Number, (2) Your Debit Card or Credit Card APIN. What if I forget my Online Password? If you cannot remember your Online Password, you need to reset them by clicking on "Forgot your Password?" link on the login page. You need to provide: (1) Your Online User ID, (2) Your Debit Card or Credit Card Number, (3) Your Debit Card or Credit Card APIN. How do I change my Debit Card APIN, Online User ID or Online Password? 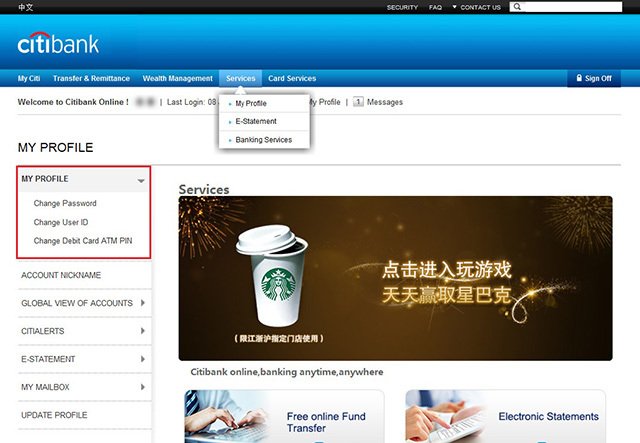 You can change the above information by first logging into Citibank Online with your Online User ID and Password. After logging in, please go to "Services" on the top navigation bar, and click on “My Profile” and then use the corresponding links to change your Online profile. Any tips on creating an Online Password? make it difficult for others to guess your password and help protect your account. Allow any combination of upper and lower case alphabets, numbers and the following special characters:,-_*&,:%!#?/+=,; Must contain at least one alphabet and one number. What are the rules for creating an Online User ID? Cannot contain more than 2 consecutive identical characters such as 111, aaa. 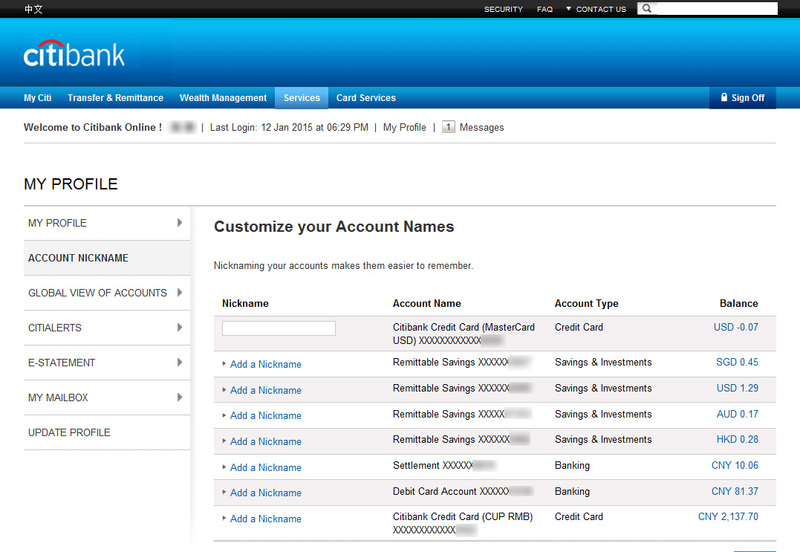 If I have problems with making transactions or accessing Citibank Online, whom can I turn to for assistance? If your Internet access is ready but you still fail to connect to Citibank Online or if you require any technical support, simply call our 24-Hour Service Hotline at 400-821-1880 or 800-830-1880 (For land lines within mainland China). If you are overseas, please call (+86)-(20)-3880-1267 (Personal and CitiBusiness customers) or (+86)-(21)-3896-9500 (Credit Card customers). 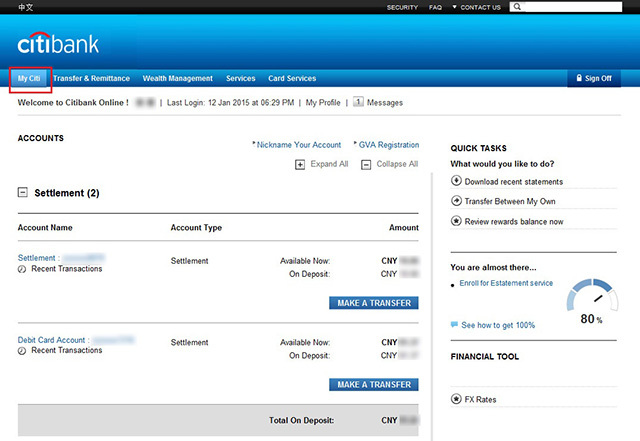 How do I know whether the transactions made through Citibank Online have been completed? You can check your transaction details in “My Account”.